All Sports Parties at Sports Connection have been offered since we first opened in 1995! We encourage kids to pick 2-3 sports, games or activities to play during their allotted time. 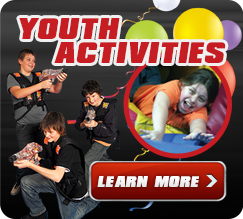 The All Sports Party can be combined with an Attraction Party at our Northlake location. All Sports Parties will pick specific sports and games to play. These parties are NOT renting the entire court for their private use.